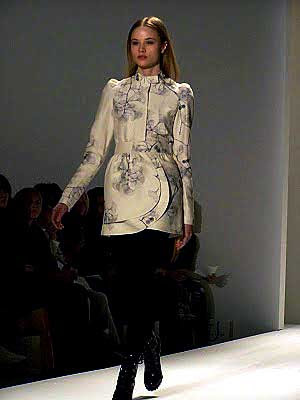 New York Fashion Week Fall 2010: the collection of Andy & Debb included a selection of ivory wool/silk blend Ginkgo biloba leaf printed pieces. Korean-born designers' Seokwon Andy Kim and Wonjeong Debbie Yoon have been a team since 1999. Beautiful, I think it was Gilbert and George that stated all this facination for the Ginkgo in applied arts you know. And G&G probably picked it up from Art Nouveau and the Ginkgo Pages. I Agree. Gilbery and George have a abstract, modernized art nouveau feel to me. I have studied a large variety of ginkgo motifs over the years and find that the current motif seen in art and fashion has been evolving for many years but accelerated as of recent. Its largely impressionist in my belief. I do believe that Lara Cameron's textile design has encouraged a large amount of independant designers to explore a similar asthetic.